Some people collect celebrity autographs, others collect spoons. I have no idea why we collect things but the reality is that we do. I collect Weber grills. My current Weber grill collection includes the following: Weber Smokey Joe Gold, Weber Jumbo Joe, 18.5 Weber Smokey Mountain, 18.5 Weber One Touch Silver, 22.5 Weber Platinum, Weber Genesis 1000 LX, Weber Genesis Silver A and Weber Genesis Gold B. My collection is actually quite small compared to many serious collectors. I am neither the best collector nor the best griller. I am just a guy who loves Weber grills. I am writing about my grills, because my collection made me aware of a problem. The problem is that finding the right covers for older Weber grills is extremely confusing. Finding the correct cover is confusing, because Weber grills last forever but the designs keep getting tweaked every few years. It is also confusing because Weber recycles the names for their grills! For example, my 22.5 inch Weber charcoal grill is a Weber Platinum. 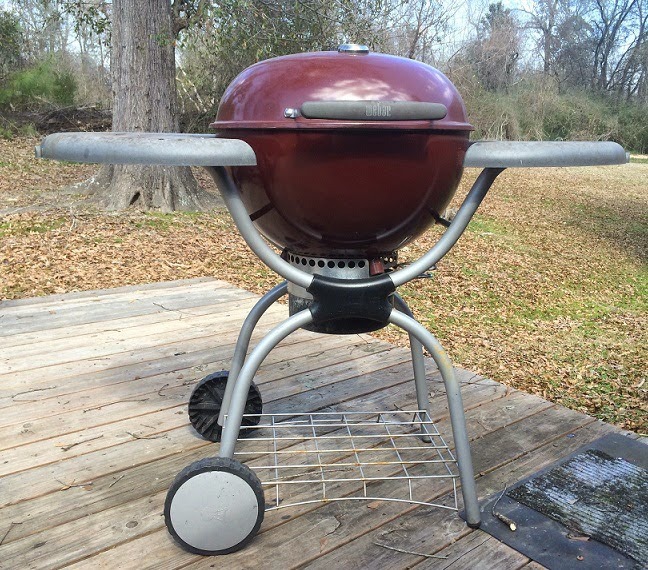 The Platinum has two side tables which gives it a unique shape compared to all other Weber charcoal grills. The Platinum is a great grill but did not sell very well. As a result this version of the Platinum was discontinued by Weber around 2011. Weber is now using the name Platinum for one of their Performer charcoal grills with a single large side table. Weber also used the name Platinum for a high end version of their Genesis gas grills that were made between 2000 and 2005. When I decided I needed a new grill cover for my Weber Platinum none of the big box stores had them in stock. When I searched online I had to sort through all of the Weber covers offered and then sort through the different covers for the different Platinum grills. Very frustrating! To help other people find exactly the right grill cover without the frustration I went through, I built the following site, Weber Grill Cover. The concept is pretty simple and the site layout will get you to exactly the right cover for your Weber in three clicks regardless of when the barbecue grill was made. It was a lot of fun building the site as it gave me an excuse to research Weber grill history. I was amazed at all the different versions of the Genesis grill that have been produced. In the Genesis line alone, there have been 14 different basic designs! By the way, if you need a Weber Genesis grill cover there are four different sizes and the site helps you figure out which one you need. I sincerely hope you find the site useful. David (owner of Weber Grill Covers web site). I want to give a great big THANK YOU to Cyndi for letting me share the site with the Barbecue Master community! You sure are a big fan of Weber. But it's a given that Weber is really one of the best, and made to last. I also own a Weber. Although, you're right. I do think that they shouldn't recycle their model name to avoid having others confused especially if there are changes between models. Hi there - great work. Which is the cover for your my 2001 Weber Platinum? I have the same one and I am looking for a replacement cover. Thanks! Great work! Which is the correct cover for yor 2001 Weber Platinum? I am looking for a replacement cover for mine. Many thanks!